For Natasha, we designed a bespoke Solitaire Necklace to match her diamond engagement ring. 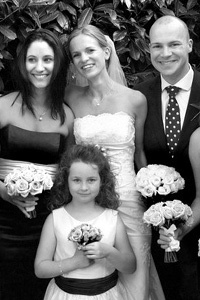 Natasha gave her bridesmaids our Ivory Solitaire Necklaces which looked gorgeous with their dark blue dresses. For Natasha’s little flower girl, we designed a bespoke sterling silver and ivory freshwater pearl bracelet which an expansion chain so that she can wear it for years to come.